Connecticut allows students to earn secondary credit in academic and/or CTE courses through postsecondary coursework. Career technical students enrolled in the Connecticut Department of Labor apprenticeship program may earn college credit, but not secondary credit. Credit for online courses is accepted on a regional basis. Public postsecondary institutions are not required to accept these credits (Education Commission of the States, 2015). The Woodrow Wilson National Fellowship Foundation partnered with several institutions of higher education to provide one early college high school as part of the Early College High School Initiative (ECHSI). More information about schools participating in ECHSI is available at the ECHSI website (Jobs for the Future, n.d.). Connecticut implements programs of study across all 16 Career Clusters. National Association of State Directors of Career Technical Education Consortium (NASDCTEc). (n.d.). 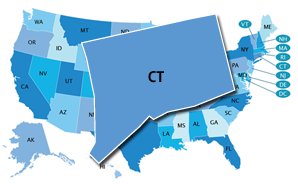 Connecticut [Interactive map of state CTE profiles]. In 2012, Connecticut mandated that all students in Grades 6–12 have a Student Success Plan (SSP) (U.S. Department of Labor, 2013). SSP and supporting activities are electronic and portable and should include goal setting for academic, career, social, emotional, and physical development; student portfolios; experiences outside the classroom; and dual concurrent credit (Connecticut State Department of Education, 2012). Connecticut may have a state-specific Early Warning System, but the system is not publicly available.